Or maybe this should be titled van Gogh and champagne. A few weeks ago Jeff and I watched a documentary on Vincent van Gogh. Since we had seen and enjoyed a number of his paintings at various museums we decided to do some van Gogh sightseeing. So last Friday we drove to Auvers-sur-Oise, France, a small town just north of Paris where van Gogh spent the last 70 days of his life. To make the drive to France a little more productive, after Auvers we drove back to Reims for a tour of the Champagne region. Driving in France is quite pleasant. The motorways are smooth and the traffic is significantly less than in Germany. However, they do like their toll roads. It costs about 55 Euros in tolls to drive to Paris and back to Germany. Sometimes Jeff isn’t as smart as he thinks. I had to explain to him that San Alcool means No Alcohol. Silly boy. So we’ve driven around Paris, north past Charles de Gaulle airport and now we’re driving into Auvers-sur-Oise. Aurver was a farming community on the Oise river in the 1880’s, popular with artists of the time and as a summer retreat for many wealthy Parisians. I’m sitting in front of the Auberge Ravoux, a cafe where van Gogh lived and ate. He had a small room upstairs in the back of the building. 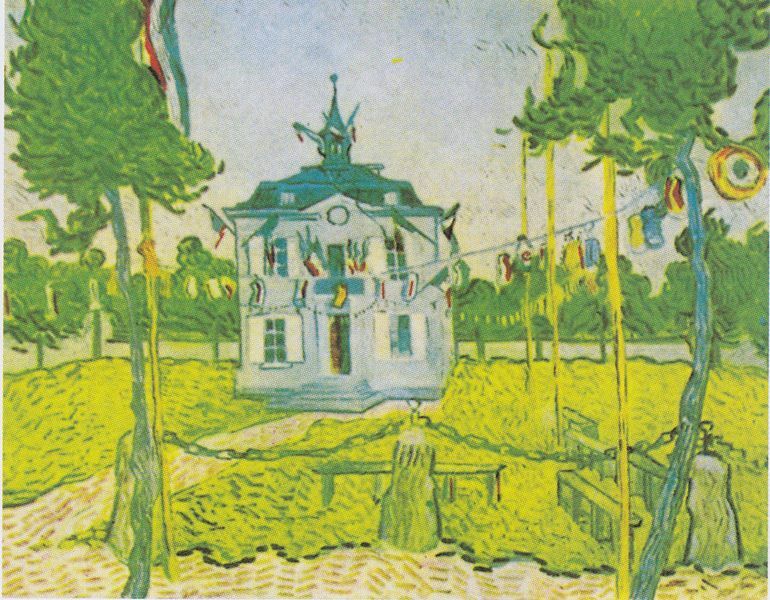 Today the building is known as House of Van Gogh (Maison de Van Gogh) because it is also the place where he died. Now the building houses a very nice restaurant. A plaque on the front wall of the Auberge Ravoux which shows the date of van Gogh’s death, 29 July 1890. The town hall of Auvers-sur-Oise, across the street from Auberge Ravoux. van Gogh painted this building during his stay and, as you can see from his painting below, it hasn’t changed much since then. The Town Hall at Auvers. 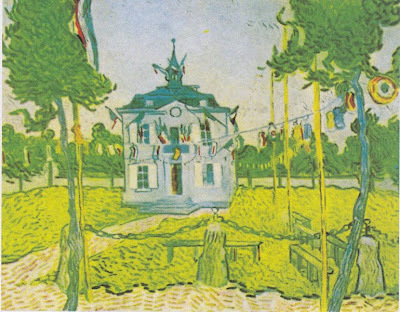 This is how van Gogh would have seen the town hall from Auberge Ravoux decorated for Bastille Day, 14 July 1890. The stairway behind the Auberge Ravoux leading up to a small souvenir shop and then up to van Gogh’s rented room. The top of the stairs and the room where Vincent van Gogh lived and died. The room is just 75 square feet. The only furniture in the room now is that single chair which I surmise represents the loneliness and despair of van Gogh. Also behind Auberge Ravoux is an alley way leading up to stone stairs that climb into a residential area. In that same alley today is this copy of a painting that van Gogh did of this alley. It's called, Village Street and Step in Auvers with Five Figures. Here’s a picture we took of the same alley. You can see the steps and railing and the same arched doorway in the wall on the left. The Church at Auvers is one of the most famous paintings of van Gogh’s, completed while he lived in Auvers. Here’s the church and a print of the painting. A closer look at van Gogh’s The Church at Auvers. Inside the church at Auvers. On the edge of Auver is this field where van Gogh painted Wheatfield with Crows, one of his last paintings. The field had already been cut so we didn't get the full effect of what van Gogh saw. The graves of Vincent van Gogh and his brother Theo. The overwhelming consensus is that Vincent shot himself in the chest, although a gun was never found, and died two days later in the bed of his small room. His brother died six months later as a result of syphilis complications. A recent biography by two historians, who completed extensive, exhaustive research, contend that van Gogh was accidentally, or possibly intentionally, shot by a group of teenage boys who had been tormenting him for some time. Our meager attempt at a bit of art. At van Gogh's grave, my iPod playing Don McClean's tribute to van Gogh, Vincent. Luckily, I'm a nurse and Jeff's a pilot because I don't think we'd make much money at this art thing. Jeff with the Vincent van Gogh statue in the town park. Vincent was apparently much taller and thinner than I expected. So we’re finished with Auvers-sur-Oise and our van Gogh portion of the trip and drove back to Reims for our champagne tour the following day. Once we arrived in Reims we went straight to the hotel. They gave us a remote to take to their parking garage so we could put the car away and then check-in. Problem was the remote didn’t open either the entry or exit door but just as we were ready to depart, both doors opened. As another guy drove out we drove in. We entered a dark, dank underground dungeon of a parking facility. We were supposed to park in spot 15 but the closest we could find to that was 215 and someone was in that. So we decided to just exit and go talk with the hotel again. Problem was, the remote wouldn’t open either the entry or exit door once again. We were stuck. Jeff searched the area for a button or switch that would open the doors, nothing. He looked for a way to disconnect the door but that was synched down tight. Finally after fifteen minutes of being trapped in the bowels of Reims, I think Jeff’s adrenalin kicked in and he was able to loosen the fixture that attached the door to the opening mechanism and pushed up the exit door. So we parked in a parking lot across from the hotel, only to find out that they’d sent us to the wrong garage to begin with. Here’s the door that Jeff disconnected; a gaping, monstrous jaw that leads to the gullet of the beast, waiting to consume unsuspecting vehicles. It was still that way when we left two days later. Here’s a view out of our hotel window. Across the street is the Porte Mars, the ruin of a 3rd century Roman gate. Beyond that on the horizon is the Notre-Dame de Reims, the Cathedral of Reims. Reims is the largest city in the Champagne region of France. At one time all French kings were crowned in Cathedral of Reims. During the 100 Years War, Joan of Arc liberated the city from the English in 1429. On 7 May 1945 the Germans signed an unconditional surrender in Reims. Many of the largest champagne houses in France are located in the city. A statue of Louis XV in the Place Royale in Reims. The front façade of the Notre-Dame de Reims, a massive 13th century structure. On this site the kings of France had been crowned since 496 AD. Inside the Notre-Dame de Reims. The altar inside Notre-Dame de Reims. The Notre-Dame de Reims had been badly damaged during WW I and has been renovated over the years. As a result there a large number of styles use on the stained glass windows of the cathedral. This middle window depicts many of the processes that go into the production of the local champagnes. An alcove within the Notre-Dame de Reims that honors Joan of Arc. The plastic sheest are because of renovation going on here. A fountain and column on the Place Drouet d'Erlon, one of the main shopping and restaurant streets in Reims. There are over 20 champagne houses in Reims. The Vranken Pommery house is one of the largest and most famous founded in 1858. There are 250 kilometers of cave/tunnel storage facilities below the city of Reims. These are vents to the Pommery caves. This large building is where the Pommery house stores its reserve wines. Most champagnes are the result of a blend of various reserve wines. To produce the same taste and characteristics of particular champagne year after year, a producer will mix a blend of previous years wines. For example, one year a particular brand may be a blend of 2003, 2005 and 2006. The next year it might be 2004, 2005 and 2007 to produce the same champagne. So all champagne producers, big or small, must have a storage of reserve wines. If a particular year has grapes a champagne producer may choose to create a vintage champagne. In that case, just that one year's grapes will be used and the eventual label will prominently show that vintage year; no reserve wines will have been used. The two main centers of champagne production in the region are Reims and Épernay. Obviously, we’re on our way to Épernay. The larger city in the valley is Épernay, one of the main centers of champagne production in France. Jeff and I on our Champagne tour. Épernay, France in the background. The village of Hautvillers. The location of the abbey where the monk Dom Pérignon discovered champagne. Bollinger is a popular champagne from this region. If you’ve ever watched the British TV show Absolutely Fabulous, you’ve probably heard Eddie talk about needing her Bolly. The Bollinger champagne house in Ay, France just outside Épernay. Vineyards in the Champagne region of France. A canal that was dug through Champagne with the express purpose of moving grapes and the resulting champagnes. I’m standing in one of the vineyards in Champagne. The vines here are trimmed to about half the height of a German vineyard. The vineyards in this region were heavily damaged in WW I. About the time they were restored WW II began and more destruction occurred. This statue of the Virgin Mary and Child is to remind the local champagne producers that their success and livelihood is in the hands of God. Our guide for the day was Amanda. Here she’s explaining the grape growing process from spring time trimming to the harvest. These grapes have a month of growing to do before the planned harvest in late September. Harvest normally takes place 100 days after the vines flower. However, here in Champagne a vintner cannot begin his harvest until he’s told to do so by the AOC, a government agency that monitors all issues and concerns of the champagne industry. We’re at the Moët & Chandon house in the city of Épernay for a tour of their caves. After the French Revolution Moët & Chandon purchased the dilapidated abbey in Hautvillers where Dom Pérignon had lived, worked and died. Because they still own the abbey, they also have the rights to the use of the name Dom Pérignon and so they are the makers of the champagne by that same name. Got our tickets for the one-hour tour at Moët & Chandon. As you can tell from the orange ticket, Moët & Chandon was founded in 1743. The very first champagne house began production in 1729. Now we’re in the caves below Moët & Chandon. They own 28 kilometers of chalk caves below the city of Épernay. Champange starts out like all wines, grapes fermented in a barrel or stainless steel vat. However, to become champagne a second fermentation occurs when the wine is then put into bottles with added yeast and sugar and sealed with a typical beer-type cap or a cork in the case of longer fermenting champagnes like Dom Pérignon . The second fermentation results in the fizz and increased alcohol content of champagne. Here you see 42,270 bottles of Dom Perignon stored horizontally. You can see the bottles of Dom Pérignon are sealed with a cork. That’s because this champagne will ferment for 8 years here in the caves of Moët & Chandon before it’s ready to go to market. 42,270 bottles just in this location alone. The Moët & Chandon had a very close relationship with Napoleon Bonaparte and here you can see a stone plaque that commemorates his visit to the caves here on 26 July 1807. Even today, Moët & Chandon has special ties to kings and queens. They have a royal warrant with the House of Windsor in England; they import champagne especially for Queen Elizabeth II. In this part of the caves of Moët & Chandon the riddling process takes place. Riddling is the method used to settle unwanted sediment at the neck of the bottle. It takes three years of training to become a professional riddler. These riddler boards allow the bottles to be placed almost level to near vertical. Over the course of a number of weeks these bottles are turned and tilted to slowly increase the angle until all the sediment as settled into the neck of the bottle. More storage racks in the caves of Moët & Chandon. A rack of Dom Pérignon . You can see by the cork how much pressure has built up in these bottles. This fermentation bottle is the same one that will go to market. The sediment will be removed, recorked, cleaned up, foiled and labeled and be ready for sale. Here I am among some riddler boards. More riddler boards. There are machines that now do the riddler process. A large metal cage of bottles is placed in these machines and it slowly tilts and turns the entire group of bottles. More Moët & Chandon caves. We’re at the end of the tour and now . . . the tasting. Bring on the champagne, that cave tour made us thirsty. By the way, that model in the advertisement on the wall is Scarlet Johansson. She’s the spokes person for Moët & Chandon. Champagne tasting in the caves of Moët & Chandon. We’re back in our van driving to Hautvillers for lunch. This street is the Avenue de Champagne in Épernay. Both sides of the street are lined with some of the largest champagne house in France. The businesses here contribute more taxes than all the business on the Champs-Élysées in Paris. That’s because of what’s underground in the caves below. The tower of the Castellane champagne house in Épernay. Their house isn’t on the Avenue de Champagne so to ensure their status among the champagne producers of Épernay they built this tower which is the tallest structure in the city. We’re in Hautvillers for lunch and we're standing, not surprisingly, on Ru Dom Pérignon. We had lunch in a retail champagne distributor who specialized in small producers. Nice starter; cheese, meat, bread sticks and champagne. Here’s the group we were touring with, all Aussies except for Jeff and I. This is the main course for lunch. That’s got to be just about the most colorful food I’ve ever seen. Inside the Hautvillers Abbey. This is where Dom Pérignon lived and worked. Although most sources say he did not discover champagne the folks of this region and our tour guide certainly accept that he did. The story goes that Dom Pérignon came up with the idea to transport wine in bottles rather than barrels. When the wine was transferred to bottles sometimes it had enough extra yeast and sugar to continue fermenting in the bottle. When that happened the pressure would build and usually the corks would pop. Any smart monk would wonder why that happened and taste the fizzy wine, from that the champagne process and industry would grow. Monks in the abbey would stood in prayer for up to eight hours a day. This is the seat they would stand in front of when they were praying. Once a monk got tired he could clandestinely pull up the bench seat into this position and then we could lean against this little ledge. With his robes covering this little seat he still appeared to be standing. Cheeky devil! The grave of Dom Pérignon in the Hautvillers Abbey. He died in 1715. Along the roads in the vineyards of Champagne stone markers like this show which house owns that particular vineyard and, of course, this one is owned by Moët & Chandon. Jeff and I in the Moët & Chandon vineyard. Now we’re visiting a smaller house, Henry de Vaugency, in the small town of Oger, an eighth generation family of champagne producers. There are over 5000 champagne producers in the region. The highest rated vineyards based on quality of grapes, soil and growing conditions receive the rating of Grand Cru. There are only 17 villages in the region that have received the Grand Cru rating. Oger is a Grand Cru village. Below Grand Cru is Premier Cru and Cru, both still highly desired ratings. Because Vaugency is a smaller producer they still use many older production methods such as this grape press. This press holds 4000 kilograms of grapes. A press takes four hours with three specific presses. At the base of the press are these three different drains. The first press is the best, most desired juice and once the amount of predetermined juice is reached the pressing stops and the drain hole for the first press is sealed. The press top is lifted, the grapes stirred up and the second portion of the press begins with the appropriate drain opened. Vaugency uses only the juice of the first two presses then the grapes are removed and the press cleaned with the water drain now open. The old reed harvest baskets and the new plastic harvest boxes. Only certain amount of grapes are put into either of these so that the bottom grapes are not squished and release their juice. Even though it’s a small operation Vaugency ships their champagne all over the world. Here’s a shipment going to Tokyo. This is stainless steel vat of Vaugency’s reserve wine used to blend for consistent taste and characteristics year-to-year. This is 5000 liters of their 2002/2003 wine. This is an automated riddler machine. Metal crates containing 1200 one-liter bottles of champagne are placed in either arm of this machine. Then the machine slowly and periodically rotates and turns to settle the sediment into the neck of the bottle. What takes weeks to accomplish by hand now can be done within a few days. These are the metal crates, 1200 bottles each, that go onto the automated riddler machine. Champagne corks before being pressed into a bottle. It takes 4 tons of pressure to press a cork into a champagne bottle. Vaugency still uses riddler boards for certain types of their champagnes. Here’s a close up of the necks of bottles with the sediment visible. Removing the sediment is called disgorging. The modern technique to disgorge is to place the neck of the bottle in a super cool liquid to freeze the sediment. Then remove the cap with the sediment, top off with a little champagne, put in the cork, clean the bottle, put on the foil and label, and it's ready for market. This is the manual method of removing the sediment from a champagne bottle. A very quick movement of popping the cap and allowing the pressure to spew out the sediment in the top of the disgorging barrel. Obviously, a bit of the champagne will escape but the bottle will be topped off. That's the reason foil was originally place around the neck of champagne bottles; so that the consumer couldn't see that each bottle had a slightly different level of champagne. This is the Vaugency cave used for both storage and riddling. Vaugency uses only Chardonnay grapes to produce their champagnes and, as you can see, they have a Grand Cru rating. Oh yeah, we're doing some Vaugency tasting too. Well, it was a wonderful day and experience in Champagne but man, or woman, cannot live by Champagne alone. We’re back in Reims and the beer low level light is on, but not for long. We certainly packed in a lot in just two days but they were a wonderful two days. We're not done with van Gogh though. Next week, the van Gogh Museum in Amsterdam. Oh, the Heineken brewery is right next door, how convenient. The sacrifices one makes for the arts. CHEERS! !